Katherine Gass Stowe's and Alexis Rockman's curatorial take on the Hall Art Foundation's huge collection is sly and enlightening in its choices and placements. One opens the door on Damien Hirst's quartered skeleton, portentously crucified by panes of glass. Opposite, the winking red taillights and re-worded street-signs of Robert Rauschenberg's sheet-metal collage dignify a truck's rear end as metaphor. 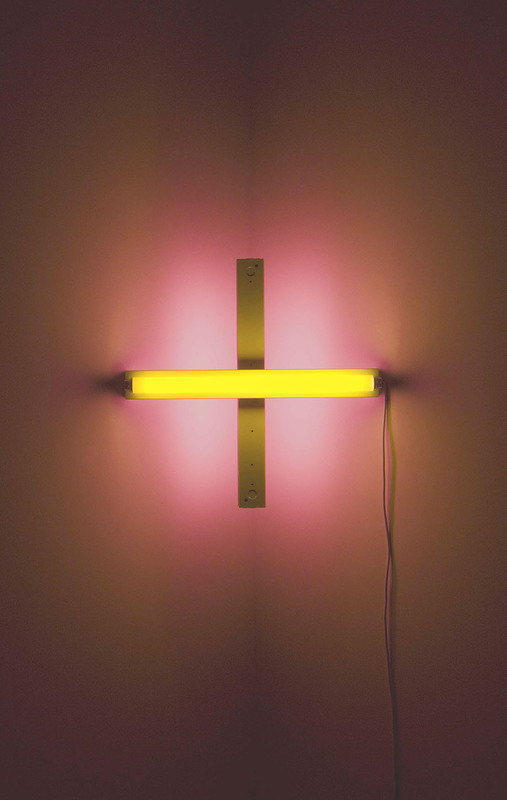 Dan Flavin's crisscrossed fluorescent light bulbs preside in a corner of the back gallery. The taller fixture, turned away, casts a rosy aura on the surrounding walls that melts into the golden radiance of the bisecting horizontal beam. Scant feet away hangs an apocalyptic oil painting by Howard Hodgkin. A single fiery sweep of a loaded eight-inch brush fuses frame with panel. Last of the trio, Olafur Eliasson diagrams palm-size orbs and discs form shifting points of view. Their pale greens, yellows, and orange floating over buff paper exhale a cool suspension of divine light.